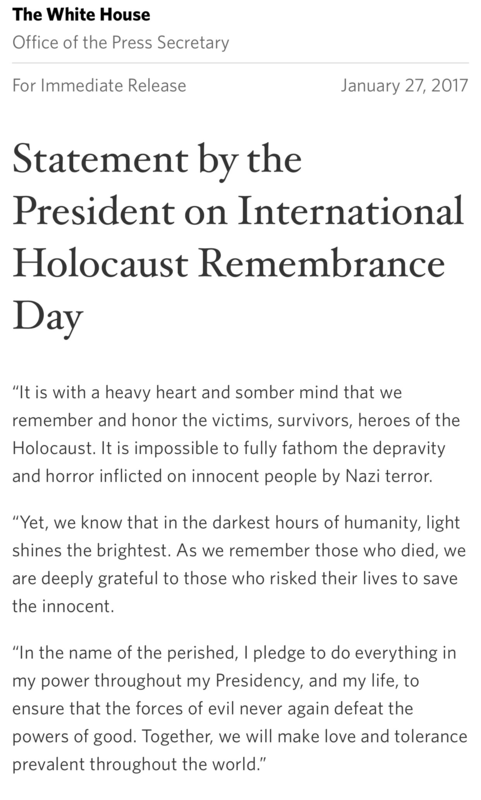 On International Holocaust Remembrance Day, the Trump White House released a statement that made invisible six million Jews murdered in the Holocaust. How do you issue a statement about the Holocaust and not mention Jewish people? Racist antisemitism, hidden in plain sight. The president’s chief strategist and senior counselor, Steve Bannon, has fanned the flames of racism and white nationalism for years through the alt-right website Breitbart. The hollow statement from Trump is a message to the racist right that Jews are being ignored and overlooked. Mainstreaming bigotry moves another step closer, not by what’s said, but by what remains unmentioned. Bannon’s White House ignored six million Jews while normalizing antisemitism. The message to racists is loud and clear, but the message is also subconsciously absorbed by Trump supporters who accept such casual bigotry that passes with little notice. The bigotry bar is lowered just a little more. The fascism flag flies a little higher. And good people do nothing. This entry was posted in Civil Rights, in the news, Uncategorized and tagged Bigotry, Donald Trump, Holocaust Remembrance Day, Steve Bannon. Bookmark the permalink. On the 27th, I stood with a group of others at a memorial plaque in our town. The Rabbi made a point of remembering, not just the 6 million Jews, but all the 5 million others – Romany, gay, disabled, the whole list – enumerating each group. He told us that if we allowed any group to slip out of our memory by forgetting that they had been singled out, we were beginning to deny the evil. It is important to remember not just that it happened, but what happened, and how it started. Thank you for spotting this. Thank you for your kind words. And for helping everyone remember.